Canon will soon be releasing the new Canon EOS Rebel T2i EF-S Digital SLR Camera. It is the latest in the Rebel line of DSLR cameras, which are excellent for photographing birds. Canon retains the classic features that photographers have come to count on. The Rebel T2i EF-S Digital SLR Camera is an excellent choice for the more advanced beginner up to the professional photographer. Captures images with exceptional clarity to provide more than enough resolution for crops and enlargements. The DIGIC 4 Image Processor speeds up the EOS Rebel T2i’s operations and offers improvement in fine detail and natural color reproduction. Allows shooting from bright to dim light. HD video at 1920×1080 resolution with selectable frame rates of 24, 25 or 30 frame rates per second. Movies are saved as MOV files. Other recording sizes include HD at 1280 x 720 or SD/VGA at 640 x 480. Full manual exposure control. An external microphone can be used for stereo sound quality. The new system delivers a very high level of accuracy by not only measuring the amount of light but color and luminosity as well. It supplies intelligent scene analysis for perfect exposure. The Canon EOS Rebel T2i can shoot up to 3.7 frames per second (fps) for up to approximately 6 consecutive RAW files or approximately 34 full-resolution JPEGs. Shooting at speeds of up to 1/4000 sec., the EOS Rebel T2i camera can capture even rapidly-unfolding scenes with ease. Wide 3.0 inch (3:2 aspect ratio) Clear View LCD monitor (1.04 million dots/VGA) for improved viewing. An anti-reflective and water-repellent coating provides a clearer and more smudge-resistant surface. New Quick Control Screen button for easy access to frequently used settings. The Canon EOS Rebel T2i’s refined button layout makes it simple to navigate among any number of settings. Quick and smooth transition between still and movie mode. No need to navigate through menus-just a simple press of a button. The Canon EOS Rebel T2i camera is compatible with both SDXC memory cards for greater storage capacity and with Eye-Fi SD cards. An Eye-Fi card enables wireless uploading of your images directly from the camera. The Canon EOS Rebel T2i is compatible with all Canon lenses in the EF lineup, from compact and lightweight lenses to ultra-wide angle and super telephoto lenses. The Canon image stabilizer, available in some lenses, minimizes the effect of camera shake. A very good feature when photographing birds. Here are a few of the new features that the Canon EOS Rebel T2i camera provides that will make every bird watchers’ pictures stand-out. The new expanded ISO range makes it easy to shoot from dim to bright light, eliminating one of the biggest concerns that bird watchers have when photographing birds. The wider LCD monitor furnishes a clearer view and the anti-reflective coating makes it easy to see the subject even in bright light. Go from still pictures to video with one quick press of a button, no fumbling with menu screens or carrying an additional video camera around all day. Shooting at shutter speeds of up to 1/4000 will surely enhance your success when photographing birds. As you can see, the new Canon EOS Rebel T2i provides many beneficial features for taking pictures and will be a valuable piece of equipment while bird watching. Canon feels that the EOS Rebel T2i camera is the best Rebel they have developed, providing some of the most advanced components of any digital SLR camera. This camera is due out in early March. I will keep you posted on the release date. Click here for more information or to pre-order your Canon EOS Rebel T2i Camera. 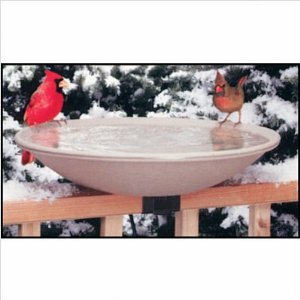 The Quick Release 150 watt heated bird bath is 20 inches in diameter. The texture ceramic surface and rim provides a safe area for the birds to land.